The Olympic flame will spend much of the day in the air on Saturday, travelling from Parkes to Mildura and on to Broken Hill. The flame will spend some time in Mildura, on the Victorian side of the New South Wales-Victoria border, before being flown to the mining town of Broken Hill, which has donated much of the silver which makes up some of the medals for the Games. On Friday the torch moved from Cowra to West Wyalong before doubling back to Parkes. During the day it travelled through Grengell, Caragabal, Wyalong and Forbes. Thursday saw the flame move north from Wagga Wagga to Cowra, via Junee, Illabo, Bethungra, Cootamundra, Wallendbeen, Young and Koorawatha. The lunchtime celebration was held in Cootamundra, birthplace of Sir Donald Bradman. On Wednesday, day 70 of the Olympic flame's Australian trek, it moved east from Griffith to Wagga Wagga. En route it passed through Yoogali, Leeton, Yanco, Narrandera, Grong Grong, Matong, Ganmain and Coolamon. The Olympic flame's first full day in New South Wales saw it hug the border with Victoria moving west from Albury to Tocumwal, before turning north and heading for Griffith. During the day it passed through Howlong, Corowa, Mulwala, Finley, Jerilderie, Coleambally, Darlington Point and Hanwood. The Olympic flame bid goodbye to Victoria on Monday, day 68 of its 100-day trek around the nation, and entered the host state, New South Wales, for the first time apart from a brief trek to Tweed Heads early in the relay. During the day the flame travelled from the ski fields of Victoria to the New South Wales side of the border twin towns of Albury and Wodonga. Beginning the day in Mt Hotham, it moved through Mt Beauty, Tawonga South, Tawonga, Dederang and Bandiana before reaching the twin cities. Although it is here to celebrate the Summer Games, the Olympic flame was treated to a taste of the Australian ski season on Sunday when it visited the Victorian ski fields. Beginning the day in Wangaratta, the flame moved south-east through former gold mining town Beechworth, Myrtleford, Porepunkah, Bright and Harrietville before arriving at the ski resort of Mt Hotham. Here, of course, the flame was carried by both skidoo and skier. 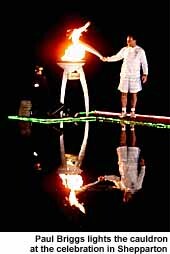 Former Winter Olympian Stephen Lee skied down the mountain with the flame in hand, lighting the community cauldron to begin the evening celebration. As the weekend began, the flame continued to wind its way north-east through Victoria, moving from Seymour to Wangaratta. Two army tanks escorted the torchbearers as they left Seymour before heading to Avenel, Eurora and Violet Town before reaching Benalla, where the lunchtime celebration was held. The last torchbearer on this leg of the flame's journey carried the torch on horseback, riding up to the stage to light the community cauldron for the celebration. In the afternoon, the flame passed through Glenrowan, scene of the shootout which led to the downfall of the infamous Kelly gang and the capture of Australia's most celebrated bushranger, Ned Kelly. The evening celebration was held in Wangaratta. On Friday the Olympic flame headed north from Healesville to Seymour in Victoria's north. It travelled through Narbethong, Buxton, Taggerty, Thornton, Eildon, Alexandra, Molesworth, Yea and Trawool. During the day it moved through a mountain ash forest and across the Eildon Lake Dam. On Thursday, former bantamweight world boxing champion Lionel Rose carried the flame as it made its way from Warragul to Healesville, via a lunchtime celebration in Emerald. It passed through the Dandenong Ranges and was also carried by Jesse Martin, who last year became the youngest person to ever sail solo unassisted around the world. The flame moved from Bairnsdale, in the state's south-east, inland to Warragul on Wednesday, with a lunchtime celebration in Moe. Julian Paynter, who ran the 5,000 metres for Australia at the Atlanta Games, carried the flame through his hometown of Moe. The evening celebration in Warragul was marked by a performance from singer Vanessa Amorosi, who was later in the week confirmed as one of a handful of Australian artists to perform during the opening ceremony. On Tuesday, the flame moved east from Morwell to Bairnsdale, stopping in Sale for a lunchtime celebration. 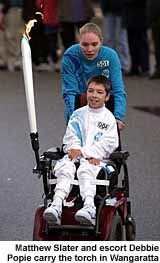 Peter Davidson, a paramedic heavily involved in the rescue of sailors during the 1998 Sydney to Hobart yacht race, was among the torchbearers, carrying the flame through his hometown of Traralgon. On Monday, the flame's trek around the nation brought it back to Victoria after five days touring Tasmania and a rest day on Sunday. It moved through some of Melbourne's outer eastern suburbs before travelling to Morwell in Gippsland. Olympian Debbie Flintoff-King was the first runner of the day. Monday's tour took the flame from Mornington to Frankston, Cranbourne, Berwick, Korumburra, Mirboo North and Morwell where it stayed for the night. 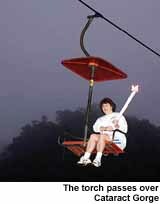 On Saturday, the flame began the day with a dawn cable-car ride across Cataract Gorge in Launceston. It also visited Hadspen, Carrick, Hagley and Deloraine, where a lunchtime celebration - the last in Tasmania - was held. On Saturday afternoon the flame was carried through Latrobe and Spreyton before leaving Devonport to make the trip back to Melbourne. Friday saw the flame travel north from the Tasmanian capital Hobart to Launceston. Travelling a total of almost 200 kilometres, it passed through Richmond, Campania, Colebrook, Oatlands, Tunbridge and Ross before a lunchtime celebration was held in Campbell Town. After lunch the people of Cleveland and Perth had their chances to share the spirit of the Games before the flame arrived in Launceston for its evening celebration. Hobart, the capital of Tasmania, hosted the flame on Thursday. Among the highlights on day 57 of the flame's journey to the Games opening ceremony were the trip by Incat from Hobart to Port Arthur and the return to the city by helicopter. On Wednesday the flame traversed Tasmania, moving from Queenstown on the state's west coast to the outer northern suburbs of the capital, Hobart. En route it visited Ouse, Hamilton, Gretna, Lawitta, New Norfolk, Bridgewater and others among Hobart's outer suburbs. On Tuesday the flame was carried from Devonport, where it arrived from Victoria aboard the Spirit of Tasmania, to Queenstown. On the way it travelled through Ulverstone, Heybridge, Chasm Creek, Burnie, Ridgley, Tullah and Rosebery. Woodchipping legend David Foster was part of the day's festivities in Ulverstone. Foster has won more than 100 woodchipping titles in his career. The flame completed the first half of its Victoria experience on Monday, travelling from Dandenong, through Melbourne's eastern suburbs to the centre of the city before winding west then south to depart on the Spirit of Tasmania. Swimmer Daniel Kowalski had the honour of running the torch aboard the boat, lighting a cauldron near the bow. Earlier, three members of the Oarsome Foursome, James Tomkins, Nick Green and Mike McKay, had carried the torch. It had also been officially welcomed to the city by Melbourne's Lord Mayor Peter Costigan. Sunday saw one of the highlights of the torch relay so far - the return of the Olympic flame to the Melbourne Cricket Ground, the main stadium for the 1956 Games. 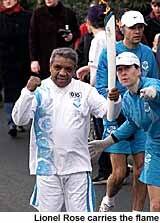 In an emotional ceremony, Ron Clarke, decked out in suit and tie rather than the torch relay uniform of shorts and t-shirt, reprised his 1956 role as the lighter of the cauldron. A crowd of 70,000 people packed into the MCG to watch the ceremony, with AFL legend Ron Barassi, former Socceroo captain Paul Wade, former Australian cricket captain Mark Taylor and hockeyroo gold medallist Louise Dobson also carrying the torch inside the stadium. 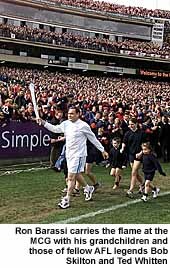 After the torch left the MCG, Melbourne played Geelong in an AFL fixture. Before and after its time at the MCG, the torch spent the day winding through Melbourne's suburbs. Saturday saw the torch arrive in Melbourne from Ballarat. On it way it visited Buninyong, Meredith, Lethbridge, Geelong, Bacchus Marsh, Melton and others among Melbourne's outer western suburbs. The evening celebration was held at Flemington, the race course which hosts Australia's favourite race, the Melbourne Cup. On Friday the flame looped from Maryborough, through Castlemaine and back to Ballarat. It passed through Carisbrook, Newstead, Chewton, Lawson's Bridge, Elphinstone, Taradale, Malmsbury, Kyneton, Tylden, Daylesford, Newlyn and Creswick. Coming into Ballarat, the flame passed by the Eureka Stockade and Soveriegn Hill, areas highlighting the rich history of the area. Among the torchbearers was Atlanta gold medallist and Sydney team member Russell Mark, who won gold in the double trap shooting in 1996. 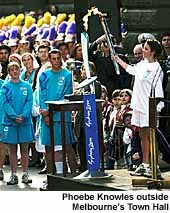 The halfway point of the Australian torch relay was reached on Thurdsay, and it saw the flame begin moving from northern Victoria towards the capital, Melbourne. And the highlight of the day was undoubtedly the relay leg completed by 109-year-old Jack Lockett, Australia's oldest man. Mr Lockett carried the torch through a 15,000-strong crowd in Bendigo, lighting the community cauldron at the lunchtime celebration. Shortly before Mr Lockett's leg of the relay, the procession was joined by an imperial dragon, Sun Loong. At 62 metres long, the dragon is the longest in the southern hemisphere and requires 37 people to carry. During Thursday the flame moved south from Shepparton to Maryborough via Mooroopna, Tatura, Rushworth, Colbinabbin, Goornong, Huntly, Epsom and Bendigo, where it stopped for a lunchtime celebration. On Wednesday, the flame was carried from Echuca to Shepparton in the state's north. One of the highlights of the day came early on as four bicycles carried the flame into Rochester, the site of the memorial to Australian cycling great Sir Hubert Opperman. Later in the day the flame travelled through Kyabram, where the lunchtime celebration was held, Lancaster and Mooroopna before arriving in Shepparton. Tuesday saw the flame hug the Murray River, which doubles as the New South Wales-Victoria border, moving south-east from Swan Hill to Echuca. Along the way it stopped in Lake Boga, Reedy Lakes, Kerang, Cohuna, Gunbower, Torrumbarry and Moama. It was met at the end of the day in Echuca by a flotilla of boats on the Murray River. 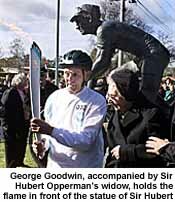 During its journey on Monday the Olympic flame travelled from Ararat to Horsham in western Victoria. It passed through Great Western, Stawell and Halls Gap. A lunchtime celebration was held in Stawell, the home of the Stawell Gift, Australia's oldest professional sprint race. During the afternoon the flame travelled through part of the Grampians National Park. The contribution to Australian Olympism of the Roycroft family was recognised during the relay on Saturday. The flame travelled from Colac to Ararat on Saturday, but it was in Camperdown that the Roycrofts were honoured. In all, five members of the Roycroft clan have represented Australia in equestrian events at the Games and three of them carried the flame in Camperdown. Pride of place went to the patriach of the family, Bill, a gold medallist in the three day eventing in 1945 in Rome. On that occasion he was famously thrown from his horse during the cross country, remounted to complete the course, spent a night in hospital with a broken collarbone then discharged himself the following morning to jump a clear round in the showjumping and help Australia to a gold medal. His sons Barry and Clarke carried the torch on horseback through the town. On Friday the flame headed from Warrnambool to Colac. Before leaving Warrnambool it spent some time on the town's whale-watching platform. During its journey on Friday the flame stopped in Allansford, Peterborough, Port Campbell, Lavers Hill, Gellibrand and Elliminyt. The route will took it along one of the most picturesque stretches of road in the nation, past the Twelve Apostles. On Thursday, pouring rain failed to dampen the spirits of torchbearers or those who turned out to see them carry the flame. From Portland, the flame hugged the coast travelling east through Narrawong, Tyrendarra and Yambuk before stopping for lunch in Port Fairy. It then headed further east with stops at Rosebrook, Killarney, Tower Hill, Illowa and Dennington before reaching Warrnambool where it will spent the night. Torchbearers on Thursday included motor racing figures Greg Murphy and Larry Perkins and Olympic cyclist Michelle Ferris on the day she was confirmed in the team for Sydney. On Wednesday, the flame moved east across the South Australia-Victoria border to Casterton and Coleraine before a lunchtime celebration in Hamilton. It then turned south, travelling through Branxholme, Condah and Heywood before reaching an evening celebration in the coastal town of Portland. Read about day one of the flame's Australian odyssey, its journey through south-east Queensland, Queensland and the Northern Territory, Western Australia and South Australia or some of the highlights of the flame's journey through the South Pacific.